It's mind boggling just how many details and decisions must be made when taking on a big bathroom renovation. From tile and lighting to pulls and towel rods, the options seem endless, yet each selection is as important as the last in the finished project. It's actually rather easy to get caught up in the finishing touch details (ahem, "What bathtub faucet should we buy?") to the point you lose perspective on the not-so-apparent things that really make a difference in overall happiness with the final results. For this simple fact, we try to create various scenarios in our head and research every item to death before we make a decision to purchase or install almost anything. It makes for a longer project with far more arguments, but we're both happier with the completed work. One of the items that fits into this category, and an item we're going to be installing in our master bathroom, is often considered a "luxury" by people who don't have it, and a "necessity" by those that do. The creature comfort feature I'm talking about? Heated floors. The photo of our guest bathroom floor created a little blog/Pinterest buzz last week, and is a Thassos marble basket weave mosaic. It's absolutely beautiful (in our opinion) but in the winter it is downright cold! This isn't a major problem since the bathroom is tiny and we don't do a whole lot of hanging out in there, but our master bath is a different story. The master bathroom is large and long, and the 12 foot walk from the bathroom door to the opposite end where the toilet sits will be far more pleasant if the natural stone floor is more tepid than frigid. Our plan is to install an electric radiant floor heating element down the center of the bathroom in the primary walking lane. This heat source will be more than adequate to keep the floor toasty, our feet warm, and will even add a little heat to a room that tends to be rather chilly in the winter. Ugh, such a horrible space. But the big question, with all of the various styles and options, what kind/brand should we use? As I see it, there are really three options that we can choose from, and each is completely DIYable. You may recognize some from popular TV shows or advertisements, others from homes stores, and some you may have seen on other DIY/home blogs. Heck, you may even have some experience with one or another in your house and can provide us with some sage advice. Regardless, our feet (and pets) would love it if you would weigh in and help us make our decision. Warmly Yours is an electric radiant mat product. 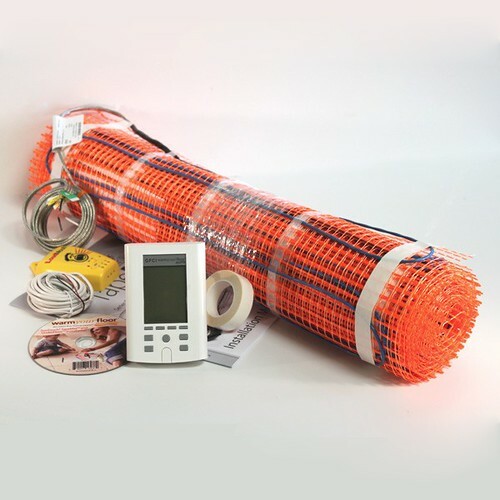 In other words, an electrical line runs back and forth through a mesh mat, radiating heat to the surrounding areas. 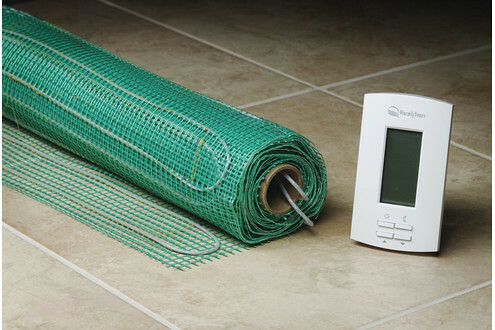 The mesh mat is installed beneath any tile floor, and the system is embedded in a layer of thinset or self leveling concrete before installing tile over the heating mat. 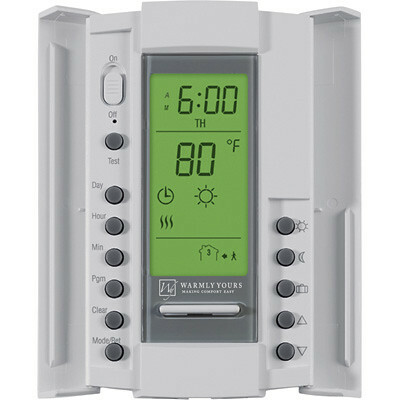 The Warmly Yours system comes with several different options for programmable thermostats, including an option for a remote sensor to detect when the floor's temperature gets too low and needs to be warmed up. 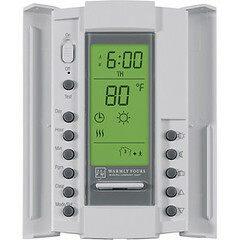 You can also set schedules like you'd expect from a typical thermostat. For our bathroom we can run off of a single circuit and can be configured to match the desired warming area of our bathroom perfectly. The advantages of this system are the programmable thermostat, no need for additional wiring in the bathroom (a circuit is already available), the single layer of thinset needed to embed the mat, and the operating costs (probably about $0.50 per day in the winter months). Similar to the first, Nuheat (the radiant heat choice of Canadian super hero, Mike Holmes) has an electric mat product, but they offer two other very different options. The first is a custom mat where you take your space's measurements and where you need heat and they'll custom make the mat to fit the space perfectly. The second is a free form cable system that allows you to specify the area with a border and wrap the heating cable as you see fit. I see the distinct advantage of having the ability to completely free form a room, especially if the room is quite irregularly shaped, but that's not really the case with our area. The primary advantage would come if the width and length of the area in the bathroom that needs heat falls between some of the standard mat sizes. 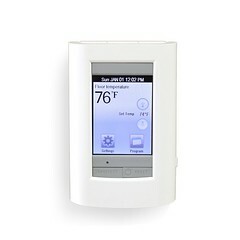 In addition the heating product, the thermostat is programmable and fits nicely in a decora style two gang outlet. Similar to the first system I outlined, the system won't add a significant amount of height, but it does require a layer of self leveling cement over the whole system. This means that thinset isn't really an option, and any bit of flooring that is out of level may cause a bigger issue. (Obviously not a concern because NOTHING in our house is out of level. Oh...wait a minute.) 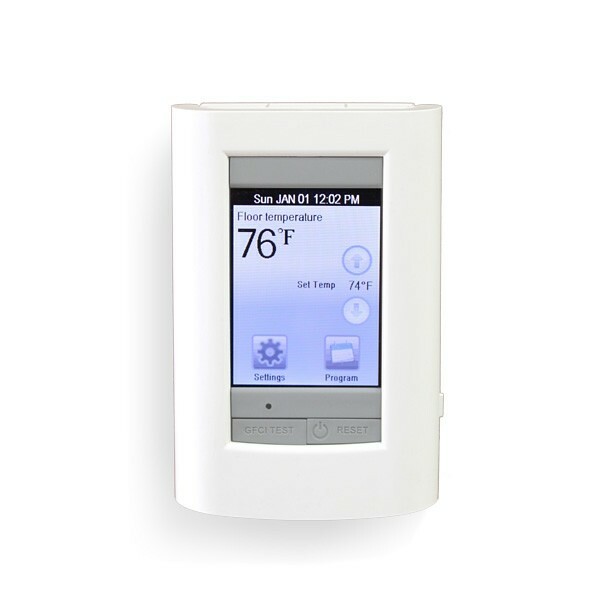 The programmable thermostat is quite nice and the system seems very DIY friendly. The mat can be sized to fit the area of install and will warm the floor roughly 15 degrees, according to the website. I get the feeling that the SunTouch product tends to be far more of a supplemental comfort than any primary heat source for a room, which I believe means lower operating costs, but also less bang for your buck. The thermostat for the SunTouch mat is pretty much the coolest. The display is very nice touchscreen, and it offers the various programmable options we want, but do we really need a cool looking display if it is going to go in the closet? Sure, the geek in me says, "Of course!!!" Again, we wouldn't need an additional circuit or wiring given the roughly 30 square feet we're looking to warm, and this product can be set under thinset without adding significant height. I think with the various options I've discussed above we can accomplish all six of the major items we're looking for. But as I said, we'd love your opinion. If you have any experience with any products, any familiarity through your own install, or just knowing someone who owns one in their house, we want to hear what you think. Very interested to see what you end up choosing! My husband & I have a very similar way of doing projects but it does seem to take forever! Best of luck. Thanks, hopefully our extra effort will be worth it in the end. I'll check it out, thanks for the info! Yay! I am very happy you are tackling this, since I will be doing the same thing in a few months. I will learn from you! I also have uneven floors, so am leaning towards a thin-set covering. I think that it's a necessity, Especially when you live with an old yucky space for a long time, then do all the hard work yourself, you deserve the nice touches - at least that's what I tell myself. 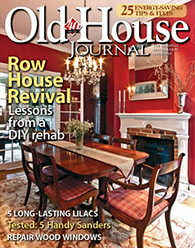 Old home ownership is consistently a source for "nice touch" justification. I find myself using the same excuse quite often. If we ever end up buying again, I have vowed to have an amazing bathroom. Said space will include heated floors. I'll be bookmarking your posts so that I know what to do when the time comes. Makes sense to me. Hopefully they will be posts about what to do, rather than what not to do. You might want to extend the heating mat to the areas where your feet will spend time as well as the major walkway - like under the toe kick of the vanity and close to the toilet. Very good point. Our mat should go right down the center of the room and extend pretty much from end to end, right in front of the toilet. It'll also be right up to the edge of the vanity, so hopefully no cold toes when brushing our teeth. We bought the materials to install a heated floor in our guest bath (which will eventually be the master bath, but that's a long story). Maybe that seems silly in Florida, but tile is still cold here. If I remember correctly the mat is from SunTouch and the thermostat & sensor are from Amazon. We actually bought the same Honeywell thermostat you show in the 4th photo. Hey, even Florida can get cold, so I understand completely. The few times I've felt the warmth of heated floors I've been totally sold. We installed something very similar to your first picture in our 120year old wonky wooden floor villa in New Zealand.We liked the fact that the net lay flat over the bits and didnt move about while we thinset it in place. In the winter you will never see your pets. It will be their new favorite hangout. My brotherinlaw works as a prison guard and the prison has heated flooring in all the cells. Apparently in the winter most of the inmates sleep on the floor! That's too funny about the prisoners sleeping on the floor. I guess it's comfortable by comparison. Glad to know it worked out well on your wonky floors. Hopefully it will work well for us too. Random nosy question... I've been reading your blog a long time and just realized I can't recall you mentioning having a powder room on the first floor. Just wondering if that was the case? I lived in an old rental and know that's pretty common. You're right, you definitely can't recall us mentioning a first floor powder room, we don't have one. It's a bit of a pain from time to time, but we've gotten used to it. I'm 99% sure that my parents recently used SunTouch in their bathroom remodel. As PP mentioned, you'll never see your pets again in the winter! I'm so jealous of their floor, it is super-cozy in the middle of the night, or when it's a balmy -17C like today! My DH helped my Dad install the floor, and I didn't hear any complaints about it, so it must be easy to install and program too. Good luck on your decision, I look forward to hearing what you guys end up doing! Thanks for the input! I think it will be funny that they just hang in the bathroom at first, but then we'll start to miss them. Maybe we'll have to set the thermostat to only warm the floors when we want them upstairs with us. Alex, we have Laticrete installed in two of our three bathrooms. I'm no mechanical girl, but I've read your requirements and our floor heating system appears to meet them. We've been living with the master bath system for four years now and it's been reliable and wonderful. We live in Old Town too, you're welcome to come by and check it out if you like. We DIY installed floor mats in both of the bathrooms we remodeled/are remodeling. 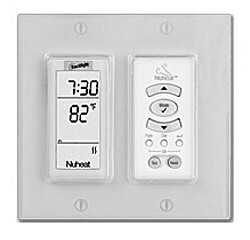 We used SunTouch mats and the Nuheat Solo programmable thermostat (most thermostats are interchangeable). At the time SunTouch didn't have that pretty thermostat you show. 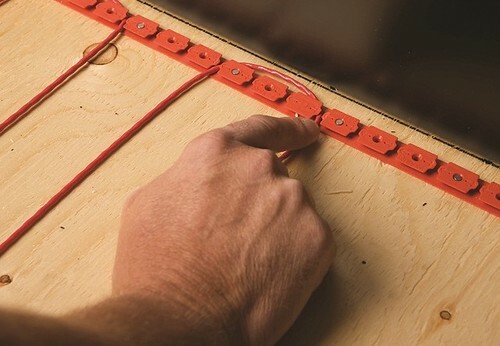 The run the wire yourself systems actually are thicker than the mats so if limiting the height to match up to an existing floor outside the bathroom is an issue you should consider using a mat. 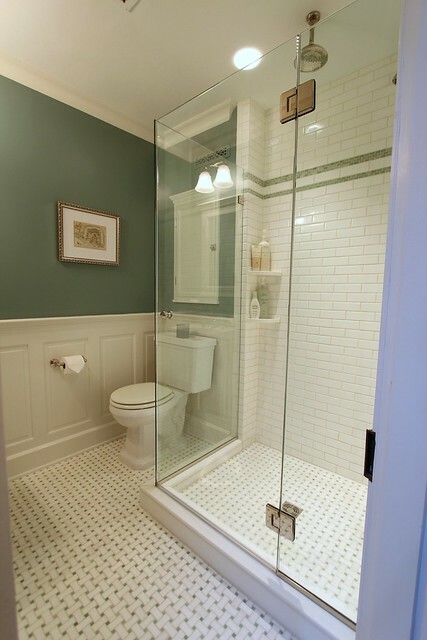 We cut the mat in a few spots to fit the nooks and crannies of the space but for the most part it was a long rectangle of open floor space like your master bath looks. We also added a second temperature sensor under the floor not connected to the thermostat in case the first one ever stops working making the mat unusable or fixable. We like the mats but they don't get as warm as we had hoped because we put them under the Ditra (where they have to go if you use that product). We would still put them in though because it's a nice feature on a cold winter morning. I'm thinking about doing this soon too. 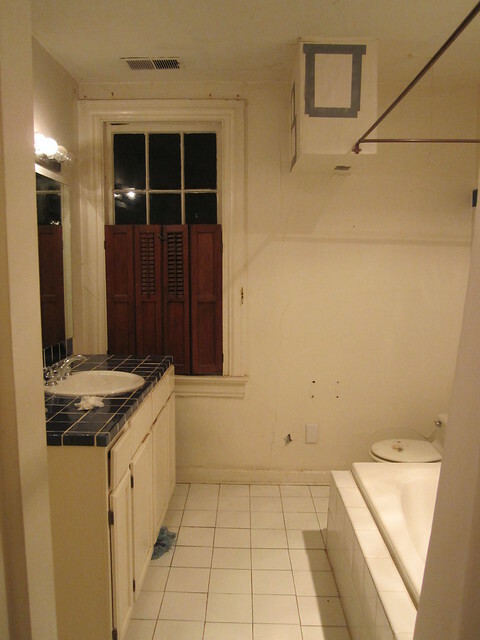 We will be renovating two bathrooms. A master and a family both upstairs. If I don't do the family, I will be doing the master. I was looking into a brand called Schluter. They have a different design that is waterproof as well. I'm sure it raises the height but it looks like the most thought out system so far. Have a look. Let me know what you think. Have you seen it? Also of your options here have you price compared? Or looked into longevity or warranties? I just noticed the date. I hope your project went well. So it’s a few years down the road. I need to replace a poorly laid floor in my master bath & got the idea of adding heat to the floor. What did you choose? What happened?